Reflecting today’s 21st-century society that embraces freedom of self-expression, many nurses and healthcare professionals choose to have tattoos, piercings, and dyed hair. Actors, firefighters, grocery store clerks, insurance agents, and musicians sport tattoos and piercings, and those of us who work in healthcare are no different. Can healthcare organizations’ dress codes be updated to keep pace with popular culture, or must nurses and their colleagues live by more oppressive rules than everyone else? During the first two decades of this century, the ideals of self-expression and personal fulfillment have caught hold in a big way. Social media allows anyone to create a public persona to show who they are in the world. Meanwhile, an increasing number of people convey their individuality through clothing, hair, or using their skin as a canvas. 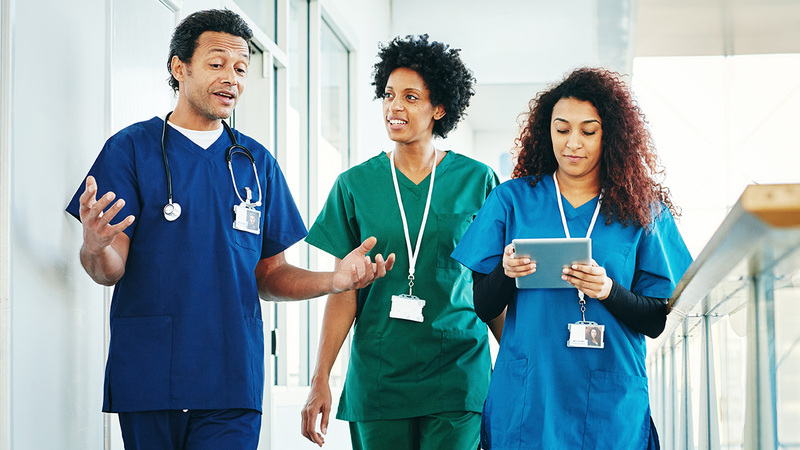 Individuals come to healthcare from all walks of life, some entering nursing or medical training directly out of high school, and sometimes from entirely different careers. That diversity of life experience is a major strength of the industry as a whole, and the last thing we want to do is turn people off to healthcare based on the enforcement of outmoded dress codes. A paradigm shift is at hand, and change is inevitable. How we approach change can truly define us, and the current challenges around tattoos, piercings, hair color, and the workplace are part of that cultural struggle. Style and fashion directly influence how people present themselves, both in the workplace and at home. Every generation poses perceived threats to the status quo created by the generations that came before them, and Millennials are no exception. It can be safely said that Millennials appear to have the most liberal and accepting attitudes of any generation when it comes lifestyle. From clothing, piercings, tattoos, and hair to gender expression, race, and sexual orientation, Millennials are leading the charge of widespread acceptance of differences. These various forms of expression are seen as the common ground from which we live and relate, and such openness to “otherness” is refreshing. The Millennial generation is more or less the same size as the Baby Boomers (approximately 80 million). While Millennials are now the largest cohort in the workplace, they haven't yet assumed overall influence and power. With Boomers and Generation X’ers still holding the managerial reins in many workplaces, a generational clash of values is at play, much as it is when every generation rises to replace those who came before. Relatively conservative Baby Boomers raised in the 1950s or 1960s may have certain ideas about appropriate dress, and we can assume that Boomers and some Gen X’ers are the likely authors of dress codes in healthcare milieus throughout the United States. With many patients being members of the generation prior to the Baby Boom (sometimes referred to as “The Silent Generation” or “The Eisenhower Generation”), we can expect that some dress codes are meant to “protect” those older patients from anything that might offend their sensibilities. For those older patients, tattoos were what sailors got on shore leave during World War II, and the current widespread trend may be difficult for them to understand. The generational clash is real, and healthcare employers must contextually examine this phenomenon with an open mind and a plan of action. As Millennials emerge as the new leaders of the healthcare system, they will rewrite dress codes and other policies. And as the World War II generation fades into history, Boomers will replace them as our elderly patient population. While Boomer patients will still have some power to influence markets and society, that influence will fade over time, and the practices and lifestyles of the younger generation will determine the norm. Change is inevitable in every aspect of society, and changes happen in healthcare at exponential speeds. Technology is in constant flux, and approaches to patient care and human resources must also shift. Just because women are a tiny percentage of CEOs and executive leadership now doesn’t mean things will stay the same. And just because tattoos were previously (often erroneously) seen as a mark of criminal activity or a perverse lifestyle, it doesn’t mean we need to impose these beliefs on nurses and healthcare professionals. Reports are still widespread of nurses being forced to cover their tattoos, remove piercings, and wash out their hair dye, even as they care for more and more patients who look and live like them. Granted, some piercings pose a risk for infection, but hair color and skin adornment do not. As we face the ongoing reality of nurse (and primary care physician) shortages, turning applicants away simply due to their means of self-expression is foolhardy at best. At the same time, some hospitals are changing their tune, and this bodes well for the future. Common ground must be found by those who work together in healthcare. Nurses are the veritable backbone of the industry, and running the risk of alienating a growing generation of young nurses is patently unwise. During the job-hunting process, nurses with tattoos, piercings, or unnatural hair color may want to research potential employers’ dress codes prior to the application and interview process. Being yourself is important, and finding an employer who welcomes you to do so is one way to avoid conflict down the road. If you’re already employed and make a decision that goes against company policy, you may have a tough fight ahead of you, but it’s not insurmountable. As time goes by and Millennials become the leaders they’re destined to be, these issues will become moot. Until then, understanding, an open mind, and a general acceptance of differences will likely do everyone involved the most good.